(1) Mix the yeast solution well. (2) Combine everything. Knead for 5 to 10 minutes until the dough is about as soft as your earlobe. If the dough becomes too stiff while kneading, it’s OK to add some of the yeast solution. When you finish kneading form the dough into a round shape. ※ If you use a baking machine for kneading, set it to knead for 5 minutes. Then knead for an additional 3 minutes by hand. If you use a food processor, knead for 1 minute. (3) Let the dough rise to 2-3 times its original size. Do not let the surface become dry. At a room temperature of around 24℃ (75℉), the dough will require a few hours to rise. This is the first rising. If the dough begins to dry out, cover it with a damp cloth. A finger test will tell you when the first rising is finished. Put some flour on your index finger, plunge your finger into the middle of the dough and pull it out. If the hole you make does not close up, the dough is finished rising. During winter, when room temperatures may be lower than 24℃ (75℉), the first rising could take up to 24 hours. During summer, with a room temperature of around 30℃ (86℉), the first rising could finish in as little as 2-3 hours. Managing the first rising at warmer temperatures, therefore, requires greater attention. (4) Once the first rising is finished, dust with grits and press the dough out with the palm of your hand to let the gas out. 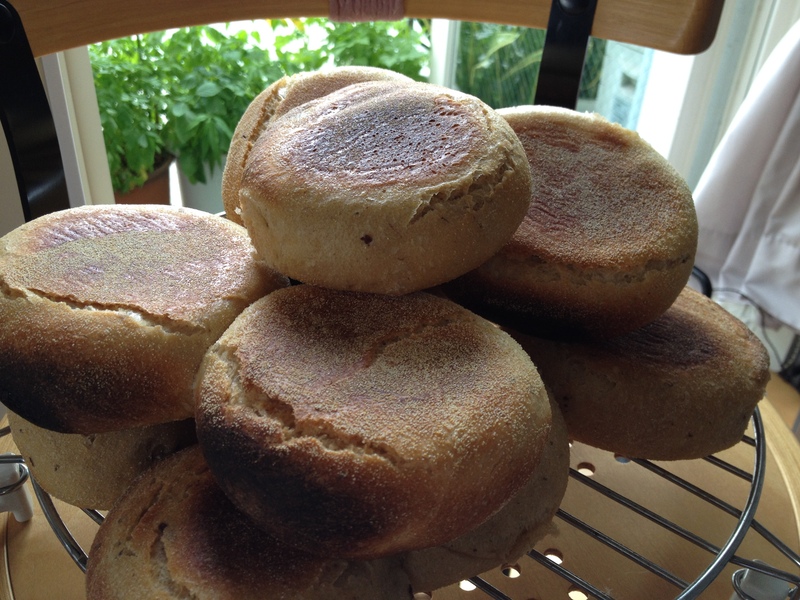 Cut the dough into 6 equal pieces (4, if you want thicker English muffins) and make each into a ball. Set these aside for about 1 hour. This is the second rising. As in the first rising, take care not to let the surface of the dough dry out. After the second rising, the dough should have fine air pockets throughout. These will cause the dough to expand significantly as it bakes. Dust the dough balls with grits. (5) Place the dough pieces on a baking tray. Place a sheet of baking paper on top of the dough and then cover the baking tray with another baking tray. This will give the English muffins their characteristic shape. Bake for 21 minutes at 220℃ (428℉).